A terror attack on Brussels airport put Europe's unofficial capital in virtual lockdown Tuesday and sent shares in travel companies tumbling. 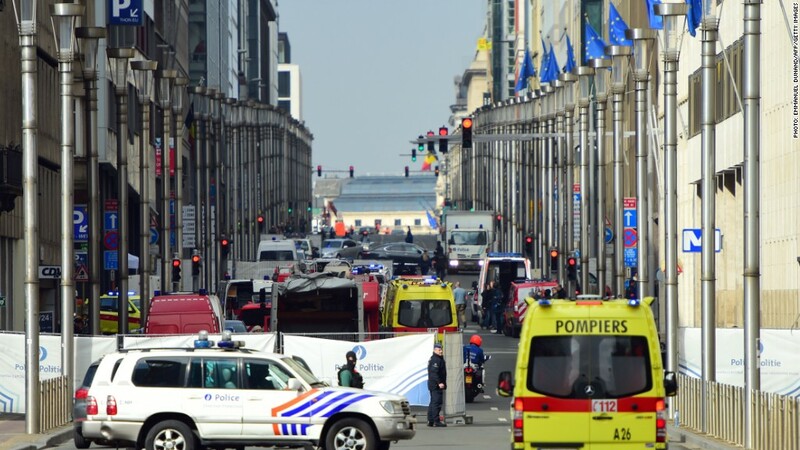 The airport and all metro stations in Brussels were closed after a suicide attack at the Zaventem international airport in the Belgian capital. Another explosion rocked the city's subway network. Dozens of people were killed, including at least 20 at a subway station. At least 10 were killed at the airport, according to local media. The airport will remain closed on Wednesday, authorities said. Yet another terror strike at the heart of Europe unsettled investors. All European stock markets fell and U.S. indexes also opened lower. Related: Has your flight been canceled after Brussels attack? Airline stocks across Europe fell by between 2% and 5%. That includes carriers such as Air France KLM (AFLYY), British Airways operator IAG and Deutsche Lufthansa (DLAKF). Airport operators in Frankfurt and Paris were about 3% lower. Hotels group Accor (ACCYY) was trading down 5%, while Intercontinental Hotels (IHG) declined 2%. American Airlines (AAL), Royal Carribbean Cruises (RCL), Carnival (CCL), Marriott (MAR), Priceline (PCLN), United (UAL), Expedia (EXPE) and TripAdvisor (TRIP) were all off about 2% each. Security was stepped up around the region, including at major airports and train stations. British Prime Minister David Cameron said the U.K. was deploying more police to ports, airports, metro stations and international train stations. Eurostar, a high-speed railway, canceled its service between London and Brussels. France ordered 1,600 additional police into the streets. In the U.S., New York police said they were stepping up security in the city's subways and other sensitive areas. Extra security was also being deployed at regional transportation hubs including Penn Station and Grand Central Station. Washington D.C.'s metro system announced that it would be increasing police patrols. Brussels is the de facto capital of the European Union, and home to many of the continent's administrative and political organizations. A senior EU official tweeted that all meetings of EU institutions have been canceled. The attack follows a suicide bombing in central Istanbul on Saturday that killed four people, including two American-Israeli dual citizens. The attack was the latest in a string of incidents targeting civilians in Turkey. In November, nine terrorists killed 130 people with guns and bombs in Paris restaurants, shops and a concert venue. In the wake of the Paris attacks, French and Belgian authorities intensified efforts to identify and monitor terror suspects, including European citizens who may have returned from fighting in Syria's civil war. -- Chris Liakos contributed to this article.